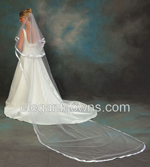 2 Tier 10" x 15" Neck Length Wedding Veil with Rhinestone edge. 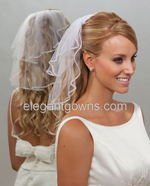 Standard cut, 54" wide on a 2" metal comb. 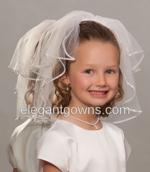 10" x 15" flower girl rhinestone edge veil, 54" wide on a 2" Metal Comb, circular cut. 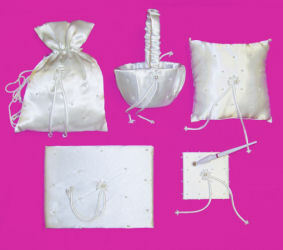 Satin & Pearl Bridal 5 Piece Set includes Flower Basket, Ring Pillow, Money Bag/Purse, Guest Book, and Pen Set.